Hunter S. Thompson's book which the film is based off is a lot of fun and this first trailer really seems to nab the same energy. Thompson is a genius at telling odd adventures under the influence of various narcotics and this story is no different. The cast is exceptional including Aaron Eckhart, Giovanni Ribisi, Richard Jenkins, Michael Rispoli and Amber Heard. Seeing Johnny Depp back in a character penned by Thompson has me smitten once again and I really hope Depp delivers like this trailer eludes. Based off the look of this trailer and how enjoyable the source material is I'd say Hunter S. Thompson and Johnny Depp fans alike are in for a treat this fall. 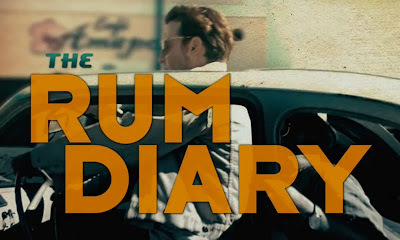 "The Rum Diary" releases October 28th.